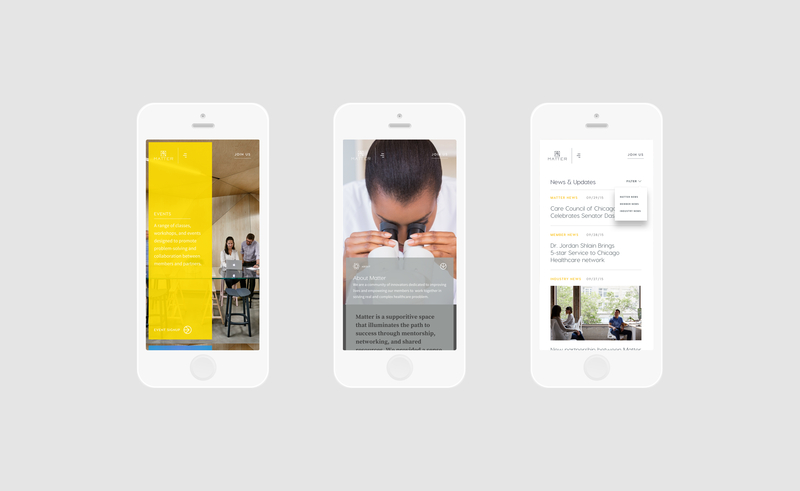 Matter is a community driven by collaboration between entrepreneurs and thought leaders in the healthcare field. Guided by the belief that complex healthcare challenges are not solved in silos, Matter equips, emboldens, and empowers leaders from across the healthcare spectrum to tackle these issues together. 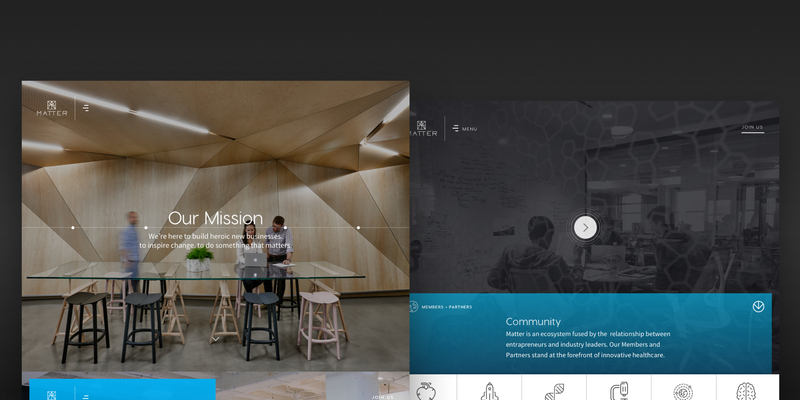 While the community exists within Matter's physical co-working space, the organization required a digital experience that would enhance online collaboration, promote new partnerships, and engage the broader healthcare establishment. 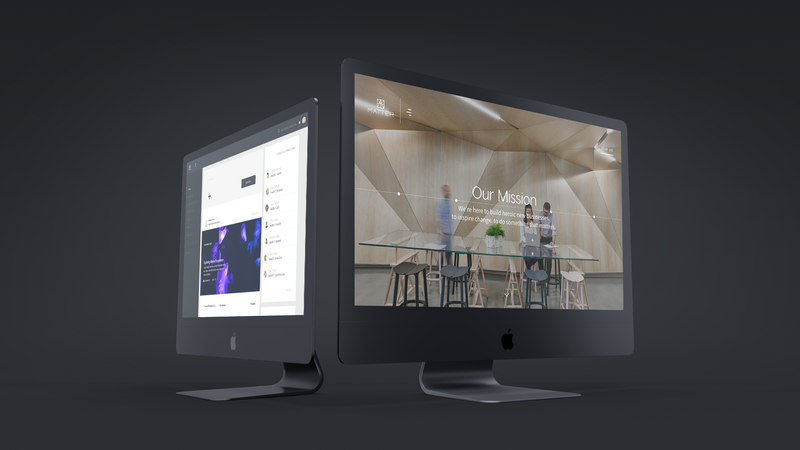 As Director of User Experience and Co-Founder of Pixl, my agency partnered with Matter to create a consumer-facing website and intranet for members to enhance their brand’s digital presence. The goal of the website was to attract new healthcare professionals to the Matter community while the Intranet would promote a greater sense of community among members via resource sharing, community updates, and company profiles. Creative Strategy; User Experience Design; Content Strategy; Wireframing; Prototyping; Visual Design; Product Design; Website Design. Understanding how members interact with the Matter ecosystem was essential to redefining the digital experience. The engagement began with a series of stakeholder interviews with members of the Matter community, staff, and affiliated organizations. Conversations were framed to facilitate the creation of a broader narrative while contextual interviews afforded a deeper understanding of the day-to-day needs and idiosyncrasies of members. 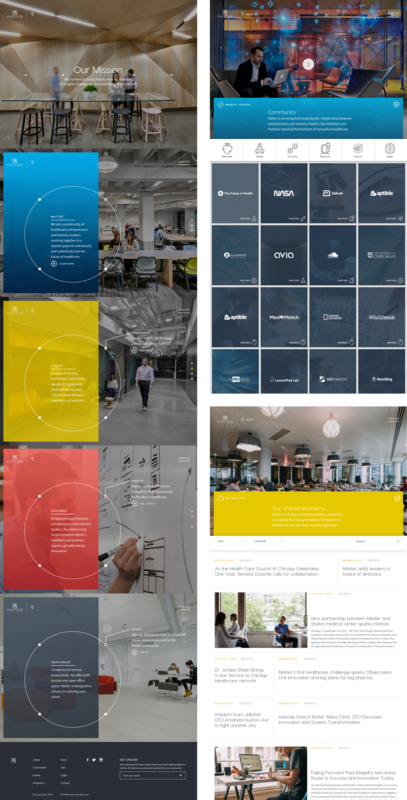 Having worked with other incubators, we recognized that simplicity and efficiency were paramount when it came to designing the intranet. Members of the Matter community needed a comprehensive tool that intuitively facilitated the completion of daily tasks. Efforts centered around improved communications, resource sharing, event management and networking. 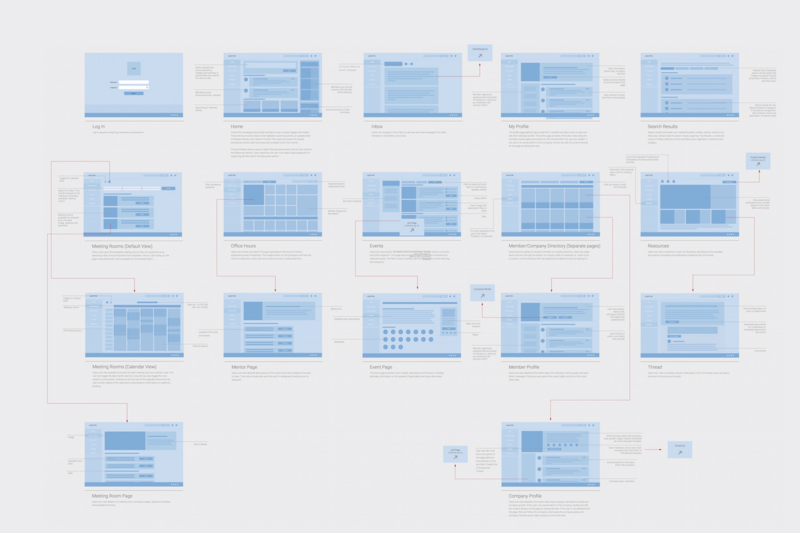 Detailed wireframes outlined advanced functionality and user flow leading to the creation of interactive prototypes and high-fidelity page mockups. 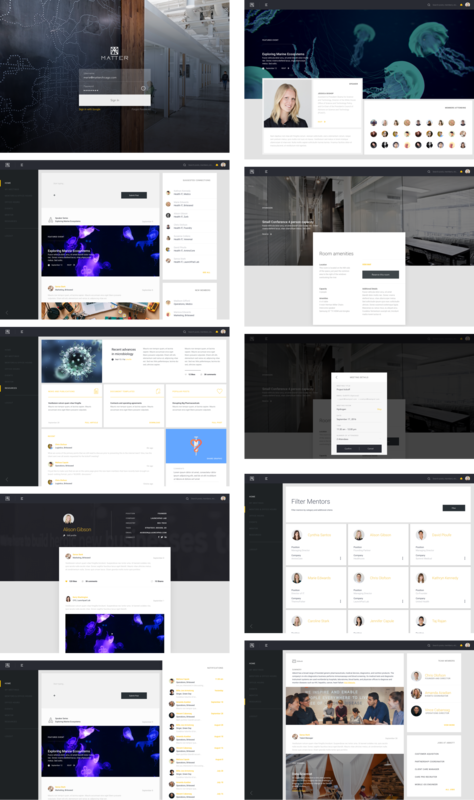 We developed an extensive component library facilitating a consistent experience as pages were designed and put into production. Backed by a custom CMS our research, design, and development efforts resulted in a consumer-facing website that provides visitors with a deeper understanding of what Matter has to offer; allowing users to purchase event tickets, schedule tours, and apply for membership. 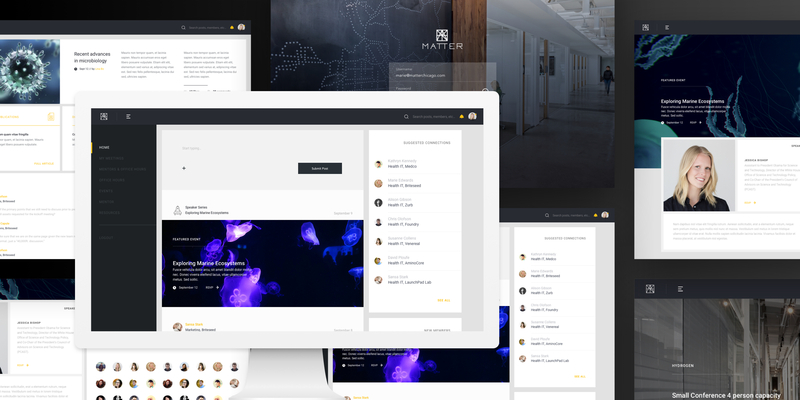 The intranet streamlines daily activities and interactions for members operating within the space while promoting collaboration and resource sharing essential to success.